The beauty in the piedmont section of the Mountains-to-Sea trail has exceeded my expectations. And the state parks here are awesome! The view from the summit of Stone Mountain is spectacular, we enjoyed a hike with the kids at Pilot Mountain, and our family loved splashing in the lake and waterfalls at Hanging Rock State Park. But these literal and figurative high points are connected by road walks. Hot, asphalt, road walks. Like so much of life, enjoying a thru-hike has as much to do with attitude as it does the trail itself. As such, I’ve decided to list 10 benefits of hiking the blacktop. 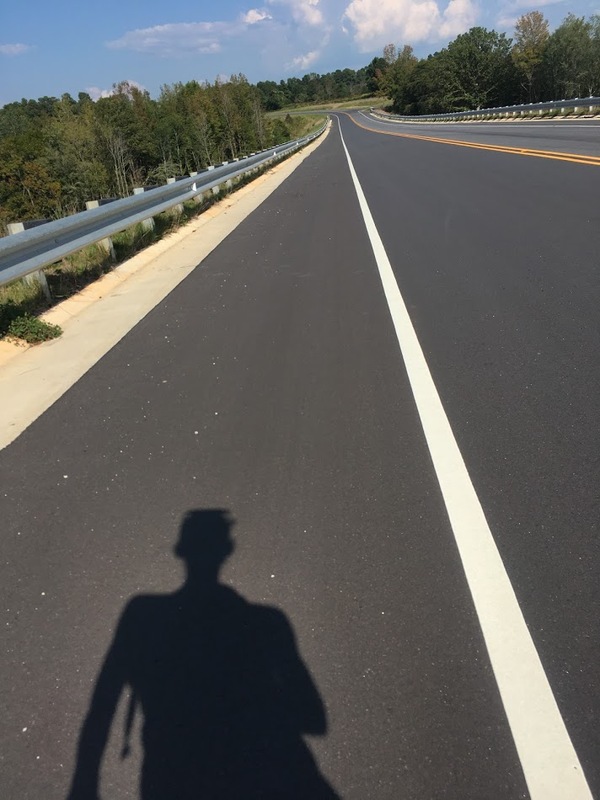 Some are serious, others more humorous, but all of them have floated through my mind and kept my feet plodding down the painted white lines and unkempt shoulders of North Carolina roadways. 10. Large semis provide a cool breeze as they roar past. 9. It’s easier to study wildlife when it’s lying still by the side of the road. 8. You often get to hike with a dog – whether you want to or not. 6. You can interpret honking however you like. 5. Your miles per hour and per day increase without additional effort. 4. It’s entertaining to watch a driver’s expression as he tries to figure out why a homeless woman with ski poles is walking down the road. 2. It’s as interesting and educational to explore farms, neighborhoods, and towns as it is to discover the habitats of plant and animal. 1. Walking down an open road is more appealing and adventurous than sitting inside of four walls. 2. It’s a whole lot easier to pee. Donate: If you like to ‘go’ in the woods, help us complete the trail by making a donation at www.mountainstoseatrail.com.